Moist is a Canadian rock band that originally formed in 1993. It consists of David Usher as lead vocalist, Mark Makoway on lead guitars, Jonathan Gallivan on guitars, Kevin Young on keyboards, Francis Fillion on drums and Louis Lalancette on bass. The band's original drummer Paul Wilcox left the band just before its hiatus in 2000, and original bassist Jeff Pearce departed shortly after its reestablishment in early 2014. After releasing an independent demo cassette in 1993, Moist was signed by EMI Music and released three official studio albums throughout the 1990s, becoming a staple of Canadian music culture. Shortly after releasing a compilation album in 2001, the band underwent an unplanned hiatus for over a decade, and then became officially reestablished in June 2013. Shortly after reuniting, the band began work on their fourth studio album, entitled Glory Under Dangerous Skies, which was released on October 7, 2014. Moist formed in Vancouver, British Columbia in the fall of 1992. Mark Makoway and Jeff Pearce had met while at Queen's University in Kingston, Ontario then moved to Vancouver where they formed an early incarnation of the group. Kevin Young and David Usher had also moved from Kingston to Vancouver to go to school. The first version of Moist was just breaking up when the four decided to do some writing together. Encouraged by this, they decided to form the new band and started playing shows. A mutual friend introduced the band to drummer Paul Wilcox. They quickly wrote and recorded songs for an independently released, self-titled cassette. Their sound was influenced by contemporary Seattle acts such as Soundgarden, Pearl Jam, Nirvana, Alice in Chains and Mudhoney. Moist spent much of 1993 touring Canada and writing material for an expanded release. In January 1994 they completed their first full-length album, which was titled Silver. Strong independent sales led to the band signing with EMI Music Canada. The album went on to sell 400,000 copies in Canada on the strength of singles like "Push", "Silver" and "Believe Me". The band was also successful internationally in countries like the United Kingdom, Germany and Thailand. In late 1996, Moist released their second album, Creature, to favourable reviews and sales in excess of 300,000 units. The album included the hits "Leave It Alone", "Resurrection", "Tangerine", and "Gasoline", all which were placed on high rotation on MuchMusic. In addition to these, a remixed version of "Tangerine" became a hit on radio and MuchMusic. 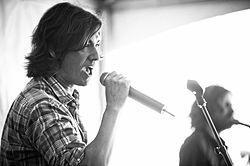 Following the band's second record, David Usher released his first solo album, Little Songs. In early 1999, the band regrouped to record their third full-length album, the melancholic and soft-toned Mercedes 5 and Dime. The album was released in the summer of 1999 in Canada and later in 2000 in the United States. Singles included "Breathe", "Underground", and "Comes and Goes". While touring in support of their final album, drummer Paul Wilcox injured his back, causing him to miss the band's final performances. Soon after he announced that he was leaving the band and retiring from music. The band released a compilation album and DVD in 2001, titled Machine Punch Through, and thereafter unofficially entered a hiatus period that would last 12 years. David Usher continued to record solo, releasing Morning Orbit in 2001, Hallucinations in 2003, If God Had Curves in 2005, Strange Birds in 2007, Wake Up and Say Goodbye in 2008, The Mile End Sessions in 2010, and Songs from the Last Day on Earth in 2012. Mark Makoway published a guide to the music industry, called The Indie Band Bible, and continued to produce and mix records. Jeff Pearce formed the band RYE, and released the album "Wolves" through Maple Nationwide in 2004. Kevin Young toured with David and worked as a freelance writer. In a posting on the official Moist website on June 15, 2013, it was announced that the band had reformed, with Francis Fillion on drums, and would be touring in November/December of that year. The post also stated that the band was in the studio and "playing around with some new ideas". The first new Moist recording in 13 years, a cover of Greg Lake's "I Believe in Father Christmas", was released through CBC Music in December 2013. The "Moist - The Resurrection" tour, a reference to their 1996 single "Resurrection", began in London, Ontario on November 28, 2013 and ended in Calgary, Alberta on December 19, 2013. In January 2014 the band, now including Jonathan Gallivan, who had accompanied Moist as a second guitarist on the 2013 tour, reconvened in Montréal to continue work on material for a new album. Although he would still be featured on some of the new record, bassist Jeff Pearce announced he would take an indefinite leave. Recording of the new songs began the week of January 26, 2014. First named tracks revealed on the band's Facebook page January 31, 2014 included "Still I Won't Look Down" and "Comes to Life". Two more titles were announced February 1, titled "We are Water" and "Comes the Sun". Glory Under Dangerous Skies is their fourth official full-length studio album (excluding their 1993 eponymous independent cassette and the 2001 compilation album). On May 15, 2014, the band announced that they had signed a new deal with Universal Music Canada. The band also announced the title of their new single, "Mechanical", which was released to radio on May 23 and to ITunes on May 27. Note: The Rock/Alternative chart was dormant from 1973 to 1995, hence no ranking for Silver's singles. Won Juno for Best New Group at the 1995 Juno Awards. Won Juno for best video (Gasoline) at the 1997 Juno Awards. Won "Q107 Canada's Rock Award" for best album (Silver) in 1995. Won "Q107 Canada's Rock Award" for best group in 1995. David Usher won "Q107 Canada's Rock Award" for best singer in 1995. Kevin Young won "Q107 Canada's Rock Award" for best keyboard player in 1995. Won an MMVA (MuchMusic Video Award) for Favorite Canadian Group in 1995. The video for the song Tangerine won Best Video, and Best Director at the (MuchMusic Video Awards) in 1997. ^ "Moist - Biography, Albums, Streaming Links - AllMusic". Retrieved 23 December 2016. ^ Wilton, Chad (5 October 1995). "POLARPALOOZAIN WHICH AN ANCHORAGE LAW CLERK GATECRASHES A ROCK FESTIVAL AT THE END OF THE WORLD AS WE KNOW IT". Retrieved 23 December 2016. ^ "Two Hours Traffic, Chance the Rapper and King Krule Lead This Week's Can't Miss Concerts". Retrieved 23 December 2016. ^ a b "Canadian Rock Band Moist Announce Lineup Change". May 31, 2014. Retrieved August 21, 2014. ^ Bliss, Karen (December 12, 2000). "Moist's drummer quits band". Canoe Jam. Retrieved August 21, 2014. ^ a b Hart, Courtney (September 17, 2013). "Moist "The Resurrection" 2013 Tour Dates Announced". Kingston Herald. Retrieved 8 March 2014. ^ Larry LeBlanc (4 February 1995). Canada: Who's Who. Billboard. Nielsen Business Media, Inc. pp. 80–. ISSN 0006-2510. ^ Larry LeBlanc (24 December 1994). A Breakthrough Year for Canadian Acts. Billboard. Nielsen Business Media, Inc. pp. 53–. ISSN 0006-2510. ^ Gallivan, Jonathan. "MOIST". Retrieved 23 December 2016. ^ a b "Moist Top Albums/CDs positions". RPM. Retrieved 2011-09-02. ^ "Gold/Platinum". Music Canada. Retrieved 2011-09-02. ^ "Moist > Charts & Awards > Billboard Singles". allmusic. Retrieved 2010-09-07. ^ "Moist Top Singles positions". RPM. Retrieved 2010-09-07. ^ "Moist Rock/Alternative positions". RPM. Retrieved 2010-09-07. ^ "Moist Canadian Content positions". RPM. Retrieved 2010-09-07. ^ "RPM - Library and Archives Canada | RPM - Bibliothèque et Archives Canada". Collectionscanada.gc.ca. Retrieved 2011-07-20.